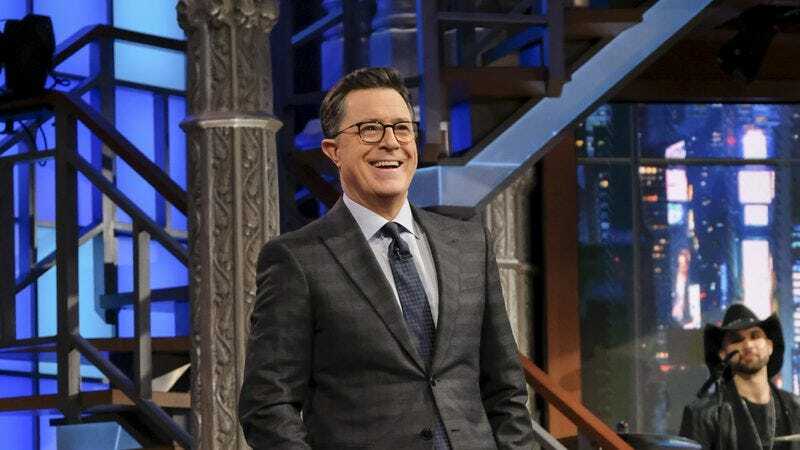 Stephen Colbert’s hot streak continues, as his CBS-set Late Show is now entering its seventh week at the top of the late-night ratings charts. That’s per The Hollywood Reporter, which notes that Colbert—whose show once struggled to compete against rival Jimmys Kimmel or Fallon—is pulling in an average of 3.2 million viewers per night, as opposed to The Tonight Show’s 3.1. Of course, all this success comes with a big demographic caveat; Colbert is winning in overall viewers, but the coveted 18-49 demographic is still sticking with Fallon, apparently more into drunk Plinko with an admittedly charming Taraji P. Henson than blistering takedowns of Trump’s new budget, or Steve Bannon’s bathtub musings.